We’ve had a good first week of school! 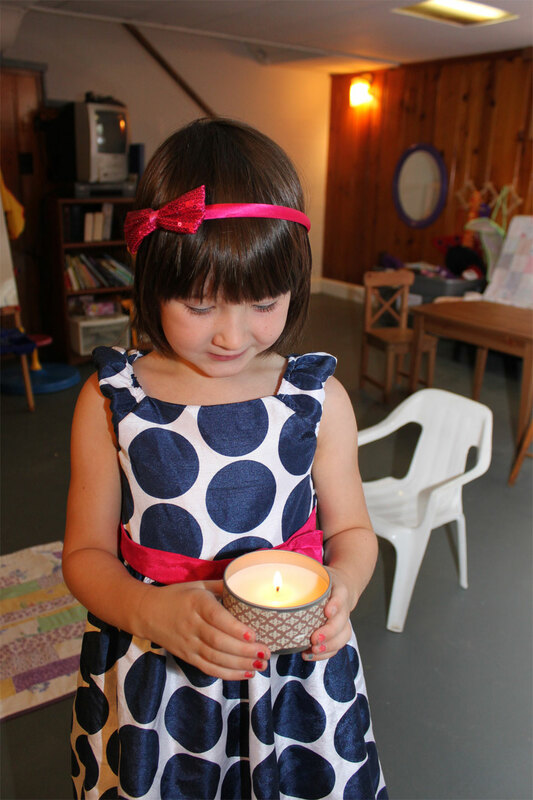 This is Dorothy getting ready to blow out our circle time candle on the first day. I’ve learned that a) homeschooling takes a lot more of my day than I had been able to comprehend (although I’d been warned about that) and b) I need to make some curriculum adjustments or we’ll both get bored in a hurry. I’ve purchased a ready-made kindergarten curriculum and I love many things about it but it’s a little soft on some skills we’re ready to march on into. That’s a great thing about homeschool, I have to say, because I can easily make these adjustments to suit my specific child. And late last night after my wee padawans were snug in their beds I snuck back down to the sewing machine and made a baby quilt to gift to a friend. This is for the first baby of an old college pal. This friend is the only person with whom I’ve attended a midnight movie showing (he was in costume) and the only person I know who owns (or owned? It’s been a while…) red contact lenses. When he told me he and his wife were expecting a boy I knew I had to make him something cool and nothing light blue or fluffy. 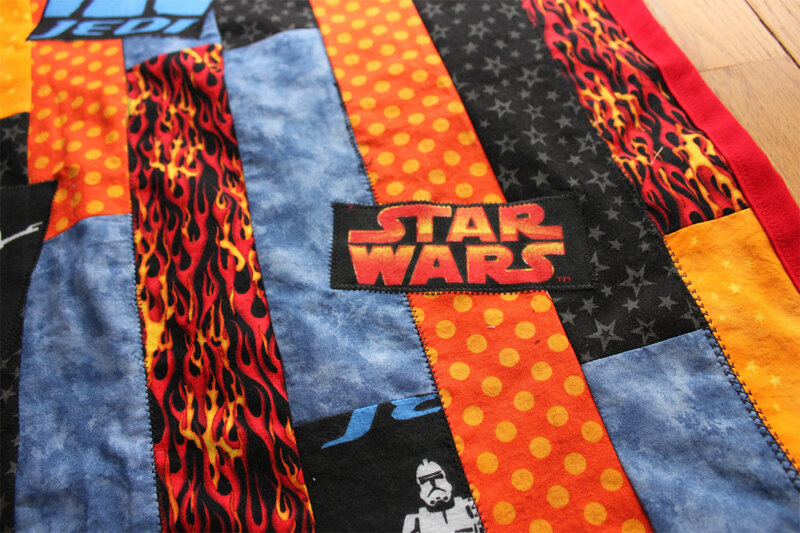 I bought one fat quarter of Star Wars fabric on Etsy, then found coordinating prints on Fabric.com. I used the licensed fabric to make homemade patches and then made strips of the rest. 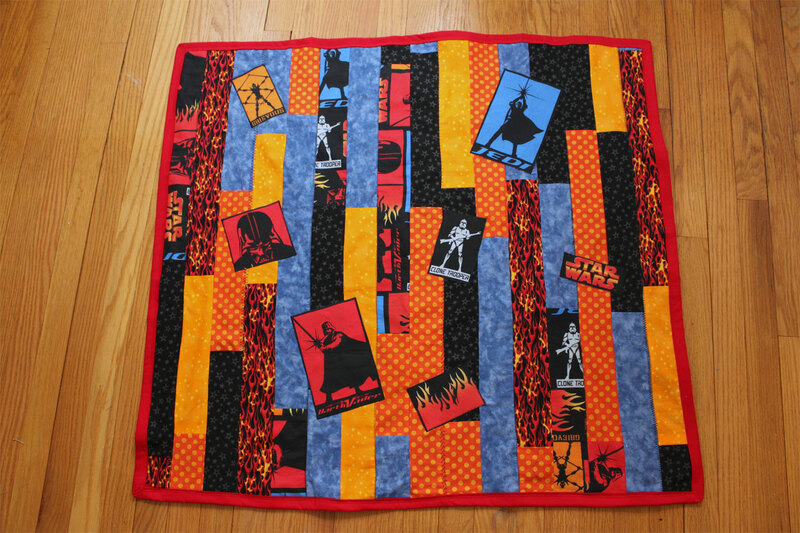 I’m not much of a quilter but I like the cutely haphazard look of strip blankets. I machine stitched it all and didn’t use batting because I wanted it to be thin and flexible enough to actually wrap the baby in. The finished size is 34 by 38 inches and the back is a soft black flannel. It felt funny to have the sewing machine threaded in black to make a baby gift, but I think this one will be appreciated by the baby’s father, at least. Ha ha, go easy on me now! Strip quilts don't really take very long to cut out, and I was up until 2:00. I'm a procrastinator, actually–I had to gift it this weekend!